A beautiful gift for that special person as they Graduate. 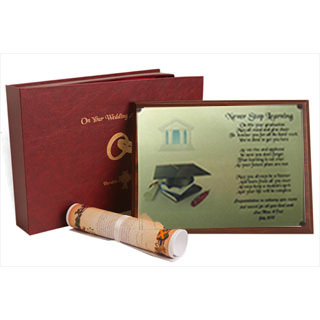 Our Graduation Plaque is wall mountable or can be self-supported with a pull out stand and is presented in a luxurious satin lined gift box. The lid of the gift box is embellished in gold leaf with the words "On Your Graduation". Please include his and her names and your gift message all in the gift message box at checkout or call 0818 222 222 for assistance. Heraldic Gifts plaques can be ordered 7 days a week. Heraldic Gifts specialise in the design and creation of beautiful plaques for stand-alone or wall display. 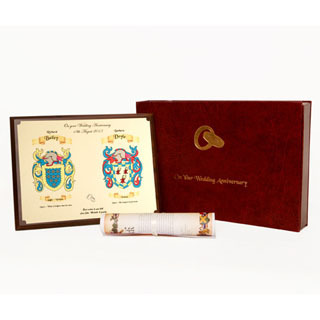 Heraldic Gifts plaques are the perfect gift to celebrate a Wedding, Wedding Anniversary or Christening. Heraldic Gifts are fully committed to excellence and our aim is to provide a service that is second to none. All orders despatched within 48 hours. Delivery available world-wide. We are dedicated to you and your satisfaction is the corner stone of our success. All orders made ordered Mon - Fri are despatched within 48 hours. Delivery Mon - Fri only.